Dawnlike all started in the fall of 2013 as an idea. A crazy, ambitious idea called DawnHack. I had recently played NetHack, but was let down with the graphics. It was then that I decided I would make a tileset worthy of this incredible game! And so I began. I drew a giant ant. Then a bee, and then a soldier ant. I worked at a furious pace, churning out tiles at superhuman speeds. And lo and behold...after the first week I had blazed my way through the first 120 tiles, a total 11% of the 1057 tiles of NetHack. But little did I know, I had just taken my first brave bites out of the great whale I would one day consume. And finally, after 3 months of on-and-off work, I ate that whale. Tail and all. 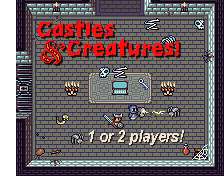 Several devs including ais523 (NetHack4) and Patric Mueller (UnNetHack) found the tileset and contacted me for some expansions. I helped them out, and the Android versions of NetHack4 and UnNetHack now include DawnHack. But I still wasn't satisfied. I lurked the web and discovered famous tilesets like Oryx's Ultimate Roguelike, Cardinal Quest, and Dungeon Crawl Stone Soup. I discovered that in the rogue-like community, there exists a high demand for high-quality, open source tilesets. Something to make rogue-likes more accessible...something to add a little pizazz...something to help newcomers discover they love rogue-likes! And so I bring you a colossal expansion of DawnHack. My time, my sweat, my magnus opus...Dawnlike. If you use this tileset you must accredit DawnBringer. That mad color-bending genius came up with the palette this entire pack lives on. Without his palette, I would probably never would have even finished DawnHack. what do you mean with " If you use this tileset, you MUST use this sprite and hide him very well!" why use and hide?? i don't understand this. I'm talking about an easter egg of sorts. Like if you try to eat a longsword 10 times in a row, then the sprite will pop up for a second. It's kind of a silly form of attribution, but it'd be awesome to see the weird places Platino pops up. That's a cool idea for attribution! I'll see if I can use these graphics in my next game. Great job! The 2-frame animation is a unique feature! I'm thinking of doing quests where the guy asks for 20 bear asses, but he needs 200. and you can complete the 20 and get done with it, but platino reveals himself if you get him 200. Is this obscure enough? what is swallowing swords I dont even.. Incredible tileset right here! I'm gonna try using this in a game I'm developing with Unity, though it probably won't see the light of day... I'll drop a message here if I do manage to get work done with a link to the game! This looks like it'll be great fun to work with! The monster animations are awesome! 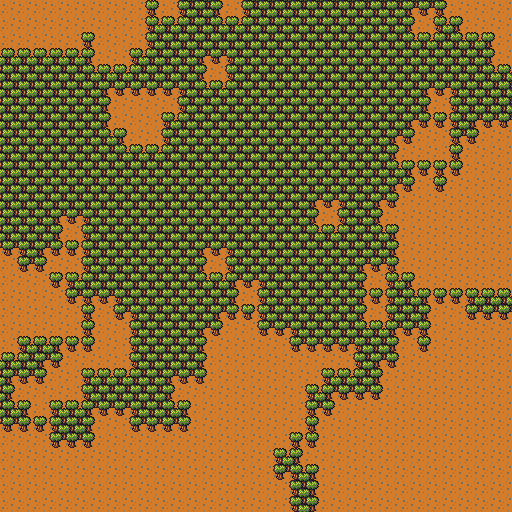 But, I'm wondering; is it possible to make the floor/wall tiles into terrains in Tiled? I'm not very experienced with the tool, and everything I tried resulted in very strange effects. Well, yes and no. If you're asking how to place sprites onto the actual tiles, then simply add a new layer and place the sprites in the upper layer. But if you're trying to turn wall tiles into floor tiles, that won't work for perspective reasons. But due to popular demand, I have made some perspectiveless wall tiles which you might be able to work with. I'll be updating the main download with them in just a minute. Those are some nice wall tiles! They make it much easier to design maps without worrying about making all the corners fit. The new monster sprites look great too! Thanks for the update! How did you make the idle animations? I've noticed that not every sprite has more than 1 position, did you manipulate the image at runtime? Yow! I'm new at this forum, I'm looking for free spritess since an ants infested my harddrive. I lost all the sprite I made, even its was just not more than 20sets, the entire harddrive was currupted.. Yet, those work are poorly design, I just wanna know how did you awesomely selected those pixels. I'm just two months at these work, but I wanna rebuild my lost game too. I wanna ask for some advice how to selected the right pixel pallets combination, can I? I'm still rebuilding up my UML design, but I felt like wanting to know about this matter too. The right palette combinations...there's a lot that goes into choosing a palette! But in all seriousness, choosing D16 as my palette for this project was more of a personal challenge than an artistic choice, so I'd advise choosing one palette for an entire project unless it's something larger like Dawnbringer 32 or the NES palette. For choosing your colors, I can only suggest reading this tutorial over at the PixelJoint forums. They show a lot of good techniques like hue-shifting and color ramps, as well as how to balance your saturation. Thanks, seem's like this can provide my needs, and lack of knowledge about pixels. I try creating a house last month, in MSpaint, manually. The result was fine since I use real image as pixel source. But its takes time to finish manually, so I try paint.net for other effects, sadly it loses the effect I wanted to be. anybody knows where I can find dawnhack ? Ahoy there. I'm using your Dawnlike tileset for some experiments and I noticed there was an error on one of the tilesets. In the Floor.png file the topmost brick floor, the light blue one, is only 47 pixels high. It seems to have been cut off, compared to the other brick tilesets below it. Ah, yes. I could've sworn I had fixed that with the last update. Maybe it's OGA acting up and not updating the file? I'll see if I can resolve this issue and upload a newer version once I get a more stable internet connection. This looks awesome! But I am wondering why everyone seems to know how to activate the tileset. Am I missing something? What do I have to do to be able to play Nethack 3.4.3 with this tileset? DawnLike cannot be installed in NetHack 3.4.3. Try DawnHack if you would like to do that. Thank you for the answer! Is there an other possibility to play Nethack with Dawnlike? Which version do I need? I've noticed that there are 6 configurations missing for the tree tiles (Objects/Tree0.png, Objects/Tree1.png), so I've added them here. With these you'll be able to make forests of any shape. Dawnlike is not a mod for NetHack. It is a collection of Creative Commons graphics based off of DawnHack. NetHack does not support tile animation, so it would not be possible to add DawnLike tiles to DawnHack. Very nice! I didn't include the interior corner tiles because I wanted to improve ease-of-use, but this looks so much better and more flexible. I'll add this to the download. I used these sprites in Game Maker tutorial. This pack has become the cornerstone of my game Mirthless ! These are amazing, thanks for sharing. Small bug. Under Objects, Ground1, 5th tile down, 2nd along, the big bush thing is missing some pixels on the left when compared with Ground0. Possibly another bug. Objects -> Decor0/Decor1, 3rd row, columns 7 & 8, the vines are both aligned left. The 'dead vines' from columns 1-4 are how I think they were supposed to be aligned. Thanks a lot! This is amazing!! Gah, you're here?! SWEET! :D Love the tiles, too! This is probably the single most craziest and useful resource that any kind of indie developer can get their hands upon. There is not enough bytes in the universe, even if we used quantum mechanics, to store the "thank you" strings I feel we owe you. Thank you so much! You really just made my day. This is amazing. The only "complaint" I have is that the animation is two frames only, but that complaint is the same level as "My pizza is 1 degree too cold! Darn it!" I'm using this for at least one game project - a Java/C++-based (not sure which yet) plot-driven Roguelike I plan on creating over the next month as a personal challenge. If the co-developer agrees, I also hope to use this (parts of it, anyways) in a Java-based (libgdx) RPG collab. Hey! Your work is absolutely wonderful, such a huge wealth of quality images was the exact inspiration I needed to take a mediocre game idea into a complete feeling project - thank you! One question I had, I noticed that the colors you work with seem to be limited to a small number of different shades and hues, what was the criteria for which colors you used? @Ninja Happy Squid: I'm guessing it's to be compatible with the popular DawnBringer palette. Has a nice nostalgic look, makes it easier to edit, and makes it compatible with all other DB pixel art. Hmm, that would make sense, but I am fairly certain that the darkest that the "dawnlike" sprites get is not actually pure black #000000, and similarly I don't believe it ever gets to pure white #ffffff which is what Dawnbringer includes. Ahhhhh I found it, it's the DawnBringer 16 color palette, not the 32. Makes sense with what I had observed. I've reached the point where I've not decided on any solid use for this, but it makes sense to point out that CC-BY-SA can be problematic for commercial developers interested in assets. I'd like to do two things. Second, ask you politely to consider if your intentions could be equally reflected by CC-BY and - if so - if you could please add that as a licensing option. The short version is that precisely what is meant by "works" in CC-BY-SA's text is problematic, and even if we assert directly that it's "only" artwork, with video games emerging as a valid artistic medium it starts to get really murky. It's hard to trust people at their word because they could always double back and get a lawyer. The text of the license itself is quite significant. I'm not sure what else in short can be said here. I'd like to also note that your credit condition can remain as part of CC-BY, as you seem to be rather fond of it. The dragon sprite thing. For better or for worse, you've made a rather remarkable set, and it'd be nice to open it up for wider use with less hesitancy. That's ultimately the point of this comment here. Oh, I wasn't aware CC-BY-SA was a kind of copyleft. I'll change it to CC-BY. First I thank you. Because it's Wonderful tile set for my RPG game. It's so useful to me but I have questions what use it. I want to use it for commercial game. if I can use it, how handle I your copyright? Just I write DragonDePlatino and DawnBringer? Like "Map and Object Artists are DragonDePlatino, DawnBringer."